Source: CICH graphic created using data adapted from The International Polar Year Nunavut Inuit Child Health Survey, 2007/2008. http://www.inuithealthsurvey.ca/pdf/Child_Inuit_Health_Survey_Aug_31.pdf -accessed August 31, 2017. The 2007/2008 International Polar Year Nunavut Inuit Child Health Survey reported that 42% of children aged 3 to 5 went to a health centre or hospital over the last 12 months for a respiratory illness. 1The International Polar Year Nunavut Inuit Child Health Survey, 2007/2008. Respiratory infections are a leading cause of hospitalization among Indigenous children. 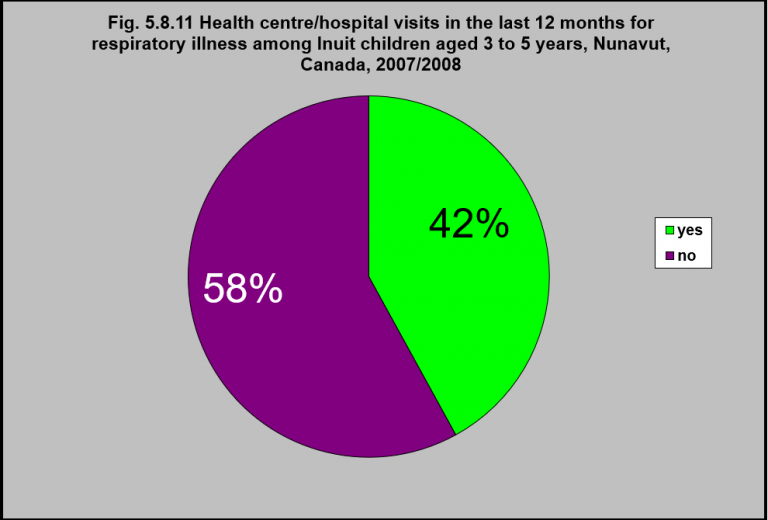 First Nations and Inuit children in particular suffer disproportionately higher rates of respiratory infections due to poverty, overcrowding, inadequate housing, poor ventilation, and increased exposure to tobacco smoke and other indoor air contaminants.1 Inuit children have high rates of respiratory syncytial virus (RSV) bronchiolitis requiring hospitalization, and they often experience repeated infections in the same season, which is considered to be unusual.1 Additionally, Inuit have high rates of Tuberculosis (TB)2 and young Inuit children have a higher risk of developing TB. The increased rates of respiratory infections early in life place Inuit children at greater risk of long-term lung diseases, suggesting the need to address respiratory infections among Indigenous children early in life. 1Kovesi, T. (2012). Respiratory disease in Canadian First Nations and Inuit children. Paediatrics Child Health, 17(7), 376-380.